Tile Roof Repair for Laguna Niguel, Ca. Laguna Niguel Roofing specializes in roof repair and we mostly work on tile roofs in Laguna Niguel and all over Orange County. 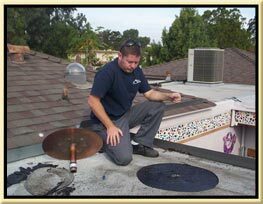 Roof leak detection and repair is our staple roofing service. Have us inspect your tile roof today and we will check everything. We will check all your flashing for proper sealant, your plumbing and heating pipes for storm collars and working caps, valleys for debris, skylights and chimneys for proper roof flashing. Your tile roof should be inspected for slipped or displace tiles annually. Finding and fixing are easy to do and it will prevent costly roof leaks later down the road. We are all about preventative maintenance and we will save you money. Call us today for a free tile roof repair estimate! Call us before the rainy season and to get your tile roof fixed first.